15 storylines to watch in NBA's second half: Will Lakers make playoffs? How long will James Harden's scoring streak last? This has been a wild NBA season so far, and some monster trades at the deadline seem to have set us up for an even crazier finish. The stretch run is set to begin Thursday as teams return to action after the All-Star break. Here are 15 big storylines to keep an eye on the rest of the way. 1. Will the Lakers make the playoffs? Before LeBron missed 17 games with that groin injury, the Lakers were looking like a threat to earn a top-four seed. Now they're 27-28, putting them three games out of the No. 8 spot with 25 games to play against one of the 10 toughest remaining schedules — which includes 13 road games and dates with the Rockets, Nuggets, Celtics, Raptors, Thunder, Warriors, Blazers, Clippers and two games against the Jazz and East-leading Bucks. To get to 50 wins, the Lakers have to go 22-3 against that schedule. Not happening. Just to get to 47, which feels like the bare minimum to have any shot at the playoffs, they have to go 19-6, and all that might mean is a No. 8 seed and a first-round beating by the Warriors. In talking to a source close to the Anthony Davis trade saga, one of the things the Pelicans are counting on is the Lakers, should other offers fall through, being willing to offer the same package for A.D. this summer that they offered at the trade deadline. League sources I've spoken with think the Lakers, for all their now-or-never posturing, will definitely offer the same package no matter what, but if they don't make the playoffs, they will be in even deeper desperation mode. All the talk about patience when the Lakers acquired LeBron was always nonsense. At every stop since he left Cleveland in 2010, there have been two common certainties: The coach is on the hot seat and the young players are on the chopping block almost immediately. It's always about "right now" when you have the best player in the world, and through that lens, failing to even make the playoffs with LeBron James, who made EIGHT STRAIGHT NBA FINALS(!!!!!!!) in the East, would be a stage-four disaster for Los Angeles. Luke Walton would almost certainly be gone, and those young players might not be far behind even if they can't get a deal for Davis. 2. How will the top of the East shake out? The Bucks, Raptors, Sixers and Celtics are the four best teams in the East. But right now Indiana, as the No. 3 seed coming out of the break, is throwing a wrinkle in the plan that those four will meet in the conference semifinals. As it stands, the Sixers and Celtics as the Nos. 4 and 5 seeds would have to play in the first round, and the loser of that series would have serious questions heading into a huge offseason for their respective teams in terms of free agency. Would Kyrie really stay in Boston if they went out in the first round? Will Jimmy Butler and/or Tobias Harris bolt from Philly if the same were to happen to them? For the Sixers and Celtics, pushing past the Pacers is of premium concern. Make sure you at least get home-home in the first round and go from there. If we do get those four in the semis, who has what seed, and thus a home-court advantage in those matchups, will be huge. It is almost impossible to separate those four teams, and the tiniest of edges could be the difference in a second-round exit and a trip to the NBA Finals. 3. Can the Rockets regain last season's form in nick of time? James Harden has kept Houston afloat, but now with Chris Paul back and Clint Capela on his way, the Rockets will be looking to assert themselves as the legit title contender they were last season. Can they do it? People in the league I spoke with at All-Star weekend think the addition of Iman Shumpert is the closest the Rockets have come in the many attempts they've made to replace Trevor Ariza. Coming out of the break, Houston trails Portland for the No. 4 seed by just one game in the loss column, which would give them home-court advantage in the first round. That's the good news. The bad news is that would likely mean a second-round matchup with the Warriors, assuming they hang on to the top seed. If the Rockets want to avoid that, they need to get to the No. 3 seed, currently occupied by Oklahoma City with a four-game cushion over Houston. The most important thing is that Houston gets right in terms of the finding that rhythm they rolled into the playoffs with last season, on both ends. The defense has to be there to have a shot to beat Golden State. If that happens, most league people I talk to still think Houston is the biggest threat to the Warriors in the West. 4. Will Dallas lose enough for Atlanta's taste? I recently asked Atlanta Hawks General Manager Travis Schlenk which team he'd be watching more intently over these final two months of the NBA season: His Hawks, or the Mavericks. He laughed. Didn't answer. But sort of did. The Mavs are very clearly on Schlenk's radar. When the Hawks swapped the rights to Luka Doncic for Trae Young on draft night, they did so in the name of acquiring multiple assets, with the Mavs' 2019 first-round pick also going to Atlanta. That pick is top-five protected, meaning if the Mavericks were to end up with a top-five selection this summer, they would keep that pick. In that scenario, the Hawks would have to settle for Dallas' first-round pick next year, which will presumably be a worse pick with the Mavs expected to become a significantly better team with the services of Kristaps Porzingis running pick-and-pop magic next to Doncic — to say nothing of whatever player, or combination of players, they are able to sign with the max salary space they cleared by trading Harrison Barnes to the Kings. Right now the Mavericks are projected to have the 10th pick if the lottery balls fall on schedule. When Atlanta made the trade, Schlenk said the Dallas pick was projected to be No. 8 according to best guesses. So it's already fallen some. Atlanta can't afford for it to fall any more. In other words, the Hawks are now in full scoreboard-watching mode, rooting for the Mavs to lose a lot of games, whereas before they wanted them to lose but not so much that they risked falling into the top-five. If Dallas were to somehow go on a run and fall to a late lottery spot, that would be a gut punch for the Hawks. As good as Trae Young has looked in areas, Atlanta needs that pick to be at least top-10 to even halfway justify giving up Doncic, who looks like an All-Star already and is on the fast track to superstardom. 5. Will the Clippers prioritize their 2019 lottery pick? The Clippers owe their 2019 first-round pick to the Celtics UNLESS it falls in the lottery, meaning they have to miss the playoffs to keep the pick. If they do that, it would add to the trove of draft assets they've acquired in addition to the two max salary spaces they've cleared. Is it really worth making the playoffs, just to get throttled by the Warriors in the first round, if it means losing a lottery pick? The first sign that the Clippers are angling to bow out of the playoffs and keep that pick was when they traded their best player, Tobias Harris, to the Sixers. Thing is: The Clippers were never about one player. They were, and still are, about a whole bunch of solid ones. Danilo Gallinari can approximate Harris' production. Lou Williams can still win a game on his own. The Clippers aren't just going to fall completely off the map unless they do it on purpose. So far, they're not doing that. They won two of three going into the All-Star break, including a win over Boston. Entering the stretch run, they occupy the No. 8 seed by percentage points and are only two games back of the No. 6 Jazz. However this shakes out, it has real implications. If Boston gets that pick, that's another asset it can throw at New Orleans for Anthony Davis. If the Clippers keep it, they could go after Davis and STILL have two max spots. Keep a close eye on this. My money says the Clippers know what's best for them and ultimately fall out of the playoffs, which may be the break the Lakers need to get in. The L.A. teams play each other in the last week of the season. Could that be an effective play-in game? Don't rule it out. 6. How much will Anthony Davis play for the Pelicans? This is going to be awkward as all heck. New Orleans clearly doesn't want to let Davis suffer a serious injury when they're probably going to need to trade him this summer for maximum value, but the league is certainly not going to like one of its best players taking healthy scratches when people paid good money to see him play. It's a terrible look. Will Davis be on a minute restriction? Will he even be playing hard for the minutes he is in there? What kind of bogus injuries will the Pelicans come up with to keep him out? This will be funny and awkward and sad all at once. 7. Will the Kings end their playoff drought? If the Clippers fall out and it's not the Lakers that take their place, the Kings, who are tied in the loss column for the No. 8 spot coming out of the All-Star break, are right there to make the playoffs. Sacramento hasn't made the playoffs since 2006. The franchise has been a running joke for a decade. All of a sudden, the Kings — led by their nuclear backcourt of De'Aaron Fox and Buddy Hield, who is one of a few leading candidates for Most Improved Player — are one of the most exciting teams in the league. It would be a huge accomplishment to get in the playoffs, even if it's just to serve as a first-round appetizer for Golden State. This team is on the rise. After Golden State, there is no consensus second-best team in the West. If the Lakers were to get in, all seven other Western playoff participants could be reasonably defined as conference-final capable. Entering Thursday, four games separate seeds 4-8, and how those matchups shake out will go a long way in determining who has the best chance of making a playoff run. Again, all these teams are right there with one another. Some match up better, or worse, with others. Who has home-court can split two relatively even teams. This is going to be a fight for seeding. The Nuggets have likely built a big enough cushion to feel pretty safe about a top-3 seed. If it stays where it's at, it would be Warriors No. 1 and Nuggets No. 2, with the real fight starting at No. 3, because that would allow you to avoid Golden State -- again, assuming they stay in te top spot -- in the second round. The Thunder currently occupy the No. 3 spot and have the inside track to stay there with a three-game lead in the loss column over No. 4 Portland, but they have a tough schedule coming down the stretch. The race gets really interesting at No. 4, the last spot for home-court in the first round. That could end up being the Thunder, Blazers, Rockets, Jazz, Spurs, Lakers or anyone in the Western playoff mix, really. Buckle up. A source close to the Anthony Davis trade saga told CBS Sports one of the main reasons the Pelicans held off on making a deal is there is still valuable information out there yet to be ascertained, including who will end up with the No. 1 overall pick — which could either be used to get a top-flight player (most people think Duke's Zion Williamson), or as a massively valuable trade chip. In past years, the Suns would be in pole position to get the No. 1 pick with the worst record in the league, percentage points worse than the Knicks. But remember, the lottery structure has changed. The bottom three teams now have the same 14-percent chance of landing the No. 1 pick, thus reducing the incentive — theoretically — to completely bottom out on purpose. Whatever. The Suns and Knicks are bottoming out. So are the Cavs and Bulls — if not because they're trying, then simply because they stink. Basically, we're looking at four teams fighting for three bottom spots. We'll see who gets punished for winning too much. What a system. 10. Will James Harden win his second straight MVP? Coming out of the break, Bovada.com has Harden as the favorite at -250, followed by Giannis Antetokounmpo at +350. It's probably a two-horse race right now, but personally, I would have that flipped. I think Giannis is the MVP right now. The Bucks are the best team in the league record wise and have been for much of the season. His numbers are off the charts. I can't move completely past Harden's 37-percent 3-point mark or 44-percent mark overall from the field. I don't think many guys could average 36 points a game, as Harden is, even if they shot as freely as he does. But there are definitely some that could, and they're the same players that were better than Harden before all this crazy scoring started and they remain better in spite of it. In that way, none of this has changed where Harden stands in the league's pecking order. It shouldn't guarantee him the award. If the Rockets go on a late run and end up with, say, a top-3 seed, considering all the injuries they've endured, then Harden is, and will be, the runaway rightful winner. But if we're talking about a guy who jacked up a million shots to score a million points to end up with the No. 6 seed in the West, and Giannis keeps doing what he's doing in leading the Bucks — the Bucks!!! — to the best record in basketball, the award should be his. The sleeper in all this is Paul George. As of Tuesday, Bovada has George at +1800. Seriously? That is serious value for a guy who is playing unbelievable basketball for a team that is on pace to finish with a top-three seed. If OKC makes a late push here and secures the No. 2 seed in the stacked Western Conference, and George keeps killing, it's not unreasonable at all to think he'll get serious consideration for the award. I'd think about a flier future bet here. 11. How long will Harden's 30-point streak continue? As it stands, Harden has scored at least 30 points in 31 straight games, which ties him with Wilt Chamberlain for the second-longest streak in NBA history. The record, also held by Chamberlain, is 65 straight. Harden is averaging over 41 points a game during the streak, which he told ESPN's Rachel Nichols in Charlotte is merely a product of necessity -- which is to say he he doesn't choose to play the way he does for any reason other than he had to do whatever he could to keep the Rockets afloat when Chris Paul, and then Clint Capela, went down with injuries. It's hard to argue. The Rockets were out of the playoffs when the streak started, and they're 21-13 since. They've risen to No. 5 in the West, right on the heels of Portland for home-court in the first round. What will be interesting is whether Harden actually adjusts his aggression, or to what degree, with Paul now back in the lineup and Capela on his way, perhaps as soon as Thursday when the Rockets face the Lakers. Even if Harden does scale back his shot attempts, his foul-drawing is the x-factor. On any given night he can easily get to the line 15-20 times. If he makes even 80 percent of those, he doesn't really have to pile up many buckets to reach 30 points relatively easily. This streak could go on for a long time. Say what you want about it, but it's something a lot of people have never seen in their lifetime and it's definitely something to track the rest of the season. 12. Will Deandre Ayton make history? If the season were to end right now, Ayton would be the only rookie in NBA history to average at least 16 points and 10 rebounds while shooting at least 58 percent from the field, per basketball-reference. If he were to keep those numbers up, that would be some kind of accomplishment for a guy who has been largely overshadowed by fellow rookie sensation Luka Doncic. Ayton has some breathing room, too, in securing that history. If he falls to 56 percent from the field but keeps those per-game numbers at 16 and 10, he'll be joined only by Shaquille O'Neal, who averaged a monstrous 23.4 points and 13.9 rebounds on .562-percent shooting in 1992-93. As the Suns continue to lose at a laughable rate, this is at least something positive to keep an eye on with this team. 13. Can Steph Curry finish in the 50-45-90 club? To be clear, that's at least 50 percent from the field, 45 percent from three and 90 percent from the free throw line. 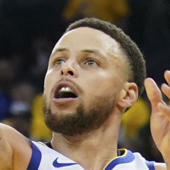 Only three players have achieved those shooting marks while playing in more than 30 games: Steve Nash, Steve Kerr, and Curry, who did it in 2015-16 when he made 402 3-pointers and became the only unanimous MVP in history. Given the volume and difficulty of the shots Curry takes, that 2015-16 season is probably untouchable. Even for Curry. But it's only his own standard he chases now, and even against that bar, he's having another head-shaking season. But he has to make a slight jump over the final 25 games in both his overall shooting percentage and 3-point percentage to re-join the exclusive club. Entering Thursday's return to action, Curry is shooting 48.8 percent from the field and 44.4 percent from three. He pretty much has the free throw percentage locked up at 92.2 percent. 14. Who will 'earn' seeds 6-8 in the East? Coming out of the break, these spots are occupied by the Nets, Hornets and Pistons — the latter two of which aren't even .500 teams. Who ends up in these spots is only interesting in the sense that any kind of playoff race is at least mildly interesting, isn't it? Actually, don't answer that. It's almost comical that the Wizards, after the season they've had, are actually in reasonable contention for a playoff spot at 24-34 and four games back of the No. 8 seed in the loss column. Other contenders are Miami (tied with No. 8 Detroit by record) and Orlando. Seriously, try to contain your excitement as you ponder why in the name of all things logical the NBA hasn't gone to a 1-16 playoff format by now. Conferences are unnecessary at best, and downright harmful to both product and players at worst. And please spare me your talk of tradition and travel concerns. Neither holds water. The bottom line is we're very realistically looking at a playoff WITHOUT LeBron James and Anthony Davis and WITH Hassan Whiteside. Please tell me who wins in this situation. Even Heat fans don't want to watch Hassan Whiteside in the playoffs. Adam Silver has to act. Wade is retiring for sure, and while Nowitzki hasn't committed one way or the other, most people feel he's probably done after this season, too. What a privilege it has been to watch both of these guys play. Wade, for my money, is a top-three shooting guard of all-time — behind Jordan and Kobe — as actual positions were a real thing for most of his career. Dirk is one of the most revolutionary players ever. True big men shooting like guards have changed the game, and a lot of that started in earnest with Dirk. When these guys finally suit up for their last game, even if Wade possibly won't be able to know it's his last if the Heat are in the playoffs, it's going to be can't miss stuff. It's definitely something to look forward to and appreciate, though I doubt either of them will be dropping 60 in their finale as Kobe did.